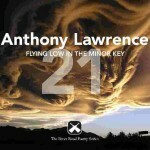 Flying Low in the Minor Key by Anthony Lawrence, River Road Press, 2011. Anthony Lawrence is unquestionably one of Australia’s most important contemporary poets. Flying Low in the Minor Key, released on CD as part of the excellent River Road Poetry series, brings together 30 of Lawrence’s finest poems spanning from his first collection to his most recent and uncollected work, read by the poet himself. There is much to enjoy here, and it is clear this fine compilation has been delicately chosen to be listened to either in its entirety or simply as individual tracks. The blurb for the release sums up Lawrence’s style perfectly, as “perhaps the most Romantic of Australian poets” but the true appeal in Lawrence’s work is in his stark imagery and diversity, and this collection is a wonderful display of his command over the lyrical, and the clear drive of narrative that runs fiercely through his verse. But I looked at him. I watched black smoke, like useless prayer, gutter into the Sydney sky. The sirens were a long time coming. While ultimately being an appreciation and acknowledgement of family that is hidden during the angst and turmoil of adolescence, as the poet and his parents now “talk… about the violent spirit of a teenage son”, while sharing “their names” and “blood”, Lawrence consistently manages to intertwine experience with evocative imagery, creating a visual element most written poetry fails to achieve. A heavily descriptive piece, water is a consistent theme in Lawrence’s work, particularly in earlier collections The Darkwood Aquarium, Three Days Out of Tidal Town and Cold Wires of Rain, and becomes a foundation for much of the work presented here. The poet has a particular appreciation for the alluring qualities of rivers and oceans in poems such as “The Trawler” and “Oceanography”, while the title poem, far different in subject describes “the night’s paint being prepared or still wet on the leaves and grass”, as a change unexpectedly occurs. The latter poem breaks away from Lawrence’s usual take on the lyric, written in the 2nd person, creating vivid imagery that causes the listener to ponder its deeper meaning, revealing the impressive range and control of the poet’s voice. Lawrence characteristically writes from the point of view of a naturalist, and this piece effectively summarizes the collection as a whole. Ultimately, this is a brilliant CD, presented in a beautifully printed cardboard sleeve that demands to be heard again and again, and would be enjoyed by any regular readers of Lawrence’s work and indeed all lovers of good poetry. To hear the poems is an experience far more intimate than simply reading in silence, and Flying Low in the Minor Key is moving and memorable listening, reaffirming why Lawrence, all these years on, remains at the forefront of Australian poetry. This entry was posted in Anthony Lawrence, Flying Low in the Minor Key, Issue 7, River Road Press, Robbie Coburn and tagged Australian poetry, australian poets, literature by Mark Roberts. Bookmark the permalink. Reblogged this on Hi, my name is Robbie..